Leroy Ninker is a small man with a big dream: he wants to be a cowboy, but for now he's just a thief. In fact, Leroy is robbing the Watsons' kitchen right this minute! As he drags the toaster across the counter – screeeeeech – and drops it into his bag – clannngggg – little does he know that a certain large pig who loves toast with a great deal of butter is stirring from sleep. Even less could he guess that comedy of errors (not to mention the buttery sweets in his pocket) will soon lead this little man on the wild and raucous rodeo ride he's always dreamed of! Nosy neighbors, astonished firemen, a puzzled policeman, and the ever-doting Watsons return for a new tongue-in-snout adventure about Kate DiCamillo's delightfully single-minded pig. 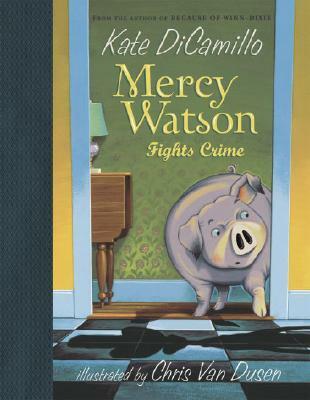 Kate DiCamillo is the author of the first two stories starring the porcine wonder, MERCY WATSON TO THE RESCUE and MERCY WATSON GOES FOR A RIDE. She is also the author of THE TALE OF DESPEREAUX, which won the Newbery Medal; BECAUSE OF WINN-DIXIE, which received a Newbery Honor; THE TIGER RISING, a National Book Award Finalist; and THE MIRACULOUS JOURNEY OF EDWARD TULANE. She lives in Minneapolis, Minnesota. Chris Van Dusen has illustrated all the books in the Mercy Watson series. He is also the author-ilustrator of DOWN TO THE SEA WITH MR. MAGEE, A CAMPING SPREE WITH MR. MAGEE, and IF I BUILT A CAR. He lives in Camden, Maine. Mercy is back in this fun third installment of merrymaking, buttered-toast eating, and crime solving. The shiny, retro pictures still amuse. Another rollicking adventure…DiCamillo has creatively woven in the elements that a good easy reader should have: repetition, simple sentence structure, and controlled vocabulary. This silly story makes my nearly 9-year-old son laugh out loud at every reading (yes, it’s been requested multiple times).